Home Telecoms Globe unveils new home broadband plans for new customers, switches from daily to monthly data caps! Globe unveils new home broadband plans for new customers, switches from daily to monthly data caps! Globe Telecom, through its home broadband brand Tattoo, has unveiled its latest roster of broadband plans for new customers with a strong bid to attract more customers and further grow its customer base. With the new broadband plans, customers get exclusive access to a portfolio of entertainment content which allows them to watch movies and basketball games, as well as stream music at the comfort of their homes. As an online entertainment service provider, HOOQ boasts of an extensive content library with thousands of movies, television episodes and shows available for users to watch, including titles from partners Sony Pictures and Warner Bros. Entertainment. With Spotify, the world’s most popular music streaming service, customers get the best music experience with access to over 20 million songs. On the other hand, the NBA League Pass allows customers to watch basketball games along with highlights, stats and other features. “We recognize today’s shift to the digital lifestyle and we want our customers to be part of this revolution by offering them a suite of plans that give them access to entertainment content such as HOOQ, Spotify, and the NBA League Pass. With our new home broadband plans, we are transforming the home into an ultimate entertainment hub as family members get the best home internet and entertainment experience in one package,” Globe Senior Vice President for Consumer Broadband Business Gilbert Simpao said. For as low as Plan 1099, Tattoo customers get an exclusive access to Spotify while exclusive access to HOOQ begins with Plan 1299. 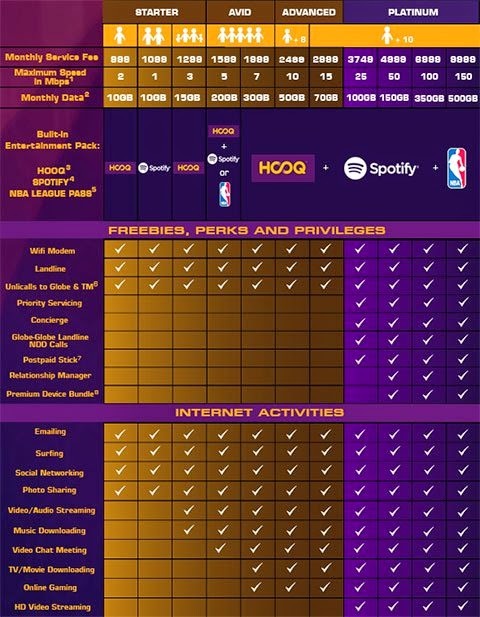 Combined access to HOOQ and Spotify or NBA starts with Plan 1599 while access to HOOQ, Spotify and NBA begins with Plan 1999 and above. All Tattoo home broadband plans come with minimum speeds of at least 1 Mbps up to 15 Mbps, bundled with free landline, free unlimited calls to Globe and TM, and free Wi-Fi modem. Each plan also comes with a data allowance representing varying types of usage for a home broadband customer. The data allocation ranges between 10GB and 15GB for light to moderate users, 20GB to 30 GB for more frequent users and 50 GB to 70 GB for heavy users. “We believe the data allocation of the Tattoo home broadband plans accurately reflects the typical usage profile of our customers. These plans were formulated precisely to meet the broadband internet requirement of our customers whether they are light, moderate or heavy users,” Simpao stressed. As an example, a monthly data allocation of 15GB under Plan 1299, recommended for light users, allows customers to watch up to 20 movies on HOOQ and stream up to 2000 songs on Spotify, he said. Still, customers who exceed their data allowance may avail of Tattoo home volume boost at P50/1GB, P200/5GB and P300/10GB, ensuring they have data connectivity at consistent speeds. To help customers determine their actual data usage, Tattoo Home is implementing a three-month program for wired customers where they will be given an additional 50GB on top of their base plan data allowance. The additional data allocation will allow customers to right-size their broadband data plan according to their actual data consumption. Customers under the program will receive text or email notifications once they breach 50%, 80% and 100% of their base data allowance. Existing customers will continue to enjoy their current subscriptions with no changes. They may also opt to upgrade to the new Tattoo Home Broadband Plans to get exclusive access to Tattoo’s exclusive suite of entertainment content comprising of HOOQ, Spotify and NBA.